Home, food, shelter and now mobile becomes the need of human life. People spend a huge amount of their hard earned money on purchasing expensive mobiles. Well, spending lots of money on phone without having insurance is dangerous because you cannot predict the future as your mobile can be stolen, it can get damage and many more issues can come. In that scenario, all you need is insurance which can buy you for the damage. So, today we will discuss everything about best mobile insurance in India. Do you need mobile phone insurance? What Includes in the Best Mobile Insurance? Which mobile insurance companies in India not cover? What is the General Amount of Mobile Phone Insurance? Is it worth for money? How you can claim for your mobile insurance? When you have spent your money on a new mobile phone, you are asked to have insurance but, do you really need it? So, yes you need it for sure because your phone can be lost, stolen or broke. For instant replacement having insurance is good. Apps, games, music and other valuable content. As we know the mobile phone is not cheap thing and it is obvious that the insurance for this will also not come for cheap. The price of the mobile phone insurance will completely depend on the brand of the phone, the model you are using and level of cover. The general premium of mobile phone insurance can be started in India from rupees 500 to 2,000 a month. When we buy a cell phone along with their insurance, there is a question always hit our mind- is it worth or not? Well, money is not the only concern but, what you are getting in his package is the biggest concern which you have to think about. The insurance you are taking will cover all your future needs. So, ideal insurance is what which can be taken care of your mobile phone in case it gets damaged or stole and it is only worthy then. The protection is given by this company cover lots of things. In this package, you will get the insurance when your phone gets damaged accident. If your phone gets damaged by water, in the case of theft, and fire diamonds or your mobile phone gets stolen by someone; the company will give you compensation. There are so many plans included in the companies package such as you can buy a basic plan at Rs. 599 while the advance plan will come up to Rs. 1999. This company gives you mobile insurance which covers physical damage, liquid damage, and fire damage. The package also safeguards your mobile phone from viruses. The basic plan of this company starts at Rs. 599 and its advance plan will come at Rs. 2499. The company only gives insurance for Android devices. This plan of insurance will protect your mobile phone from theft and in the case of a data loss. If you get any of the issue just call the company and the executive will come at your doorstep to pick the phone which has issues and pay for that damages. Mobile Assist provides as per the amount of the mobile. When we talk about the mobile insurance company the name of Sync and Scan always come in the list. The company gives full coverage for accidental damage, water damage, strike and, stolen. The company also gives safeguard from any third party damage. There are different packages are available from where you can buy your best mobile insurance. This is one of the best companies that work not only for Smartphone’s but also give insurance for laptops, tablets and your cameras. Along with the normal coverage, the company gives insurance for Hardware failures, malfunctioning touch screen, charging port issues and many more. The companies just pick your mobile phone effect and make the mobile defect free and send it back to the customer. The company is also giving so many plans for mobile insurance. You can get a warranty for accidental damage to your respective mobile phone and tablets. When the is older than 90 days then you can buy a good package from Warranty Bazaar to safeguard your gadgets. The accidental damage protection of the company is designed to protect the owner from all the prices of repairs which the dealer or manufacturer denies covering. You can get 12-month accidental damage protection gadgets. The company is renowned in India to give a wide range of insurance policies to its customers. 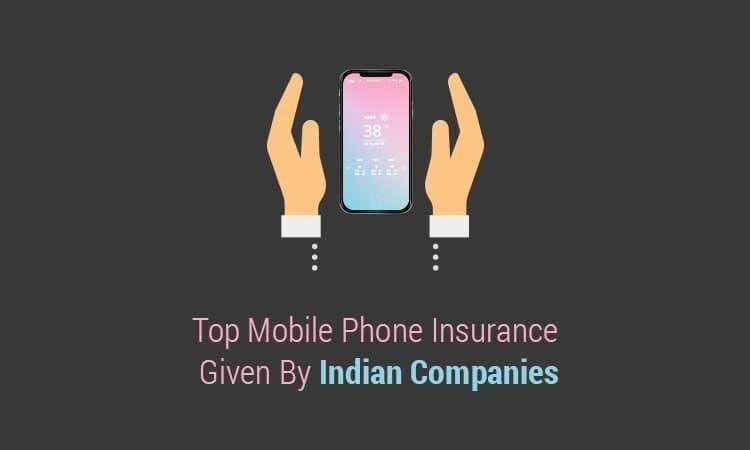 From insurance to medical policies, New India Mobile Insurance is giving protection for the gadgets. If your phone gets damaged due to fire, strike activities, terrorist activities, and any other accidental issues company will give you the damage price. The procedure to document a case under the protection act is important. So as to document guarantee, you should furnish the protection supplier with the buy receipt/bill of your cell phone, alongside its sequential number. Likewise, you should record an FIR at the police station within 24 hours of your damage. You can petition for a case inside 48 hours, alongside the case suggestion reports and the FIR. If your mobile phone is still under warranty you may not require a different protection strategy. Be that as it may, guarantees just will in general spread mechanical issues so check the terms before you rule against the discrete spread. Your substance protection may cover your own belongings from your home. Be that as it may, you may pay a higher abundance on the off chance that you guarantee, and claims may expand your premium. You could place cash in a bank account every month, to take care of the expense of fixing or supplanting your portable. Pick a record that gives you simple access to your cash, and considers the hazard that your telephone could get harmed before you have enough cash spared to supplant it. Thus, if you are going to buy an expensive phone then, never forget to buy insurance for a mobile phone. One thing is to take care while buying protection that- is the policy covers all the issue which might come in your way. Previous articleTop 8 Highly Profitable Automotive Business Ideas That You Need To Know? Next articleHow To Check EPF Balance Using Mobile? How Masked Aadhaar Card Is Different From Regular Aadhaar Card?